Time marches fast, even on vacation. It’s hard to believe our plans are steadily becoming history, as the days become weeks. After 28 days we have reached the halfway mark of our trip, and signs of homesickness (or maybe travel weariness) have arrived. The fighting in the car is increasing, as are statements longing for home. But one of the beauties of being in a new environment without one’s favorite toys, is the added motivation for creativity. At the house on Merrymeeting Lake last week, for example, Emmett and Aaron discovered a small rubber fish that must have been used as bait by a recent fisherman. This squishy little thing provided hours of entertainment, as they took turns throwing the fish into the lake, then jumping off the end of the dock to race each other to get it. Now our adventure marches on to the second New Hampshire lake houses, in tiny Newbury, est. 1778, far from the more tourist-oriented locales. The town is charming, the house itself is more remote, rustic…and without cable TV, cell phone or internet service. It’s going to be wonderful. This morning, instead of Emmett being glued to The Disney Channel, he and Christopher rowed “our” little boat out to an island in the middle of the lake, on which someone has strung a rope swing on a high tree. Christopher expertly guided Emmett through his fears, and Emmett is now a rope-swing-into-a-lake kind of kid. Aaron and I stayed back in the house, gobbling down more chapters of Harry Potter and the Deathly Hallows, which he’d begun our last day in Manhattan, on the F Train to Brooklyn. 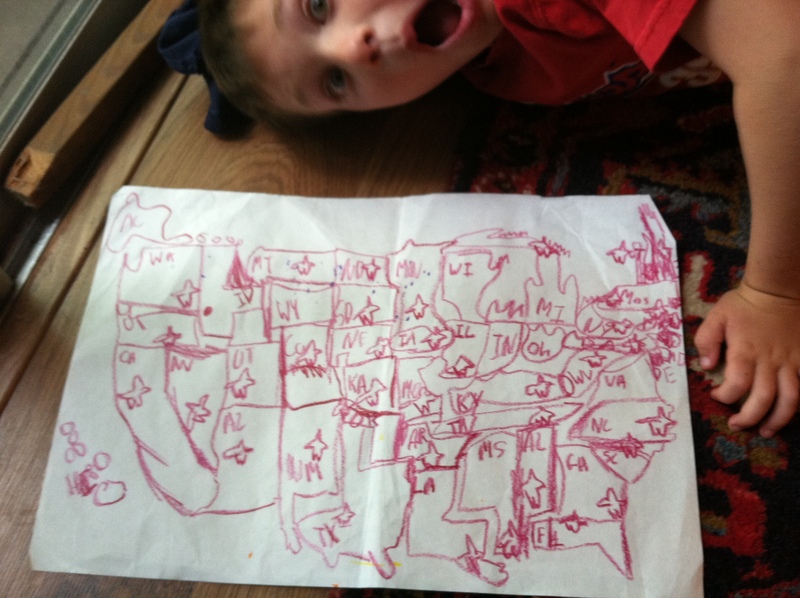 By late morning, we set out for Manchester with two big plans. 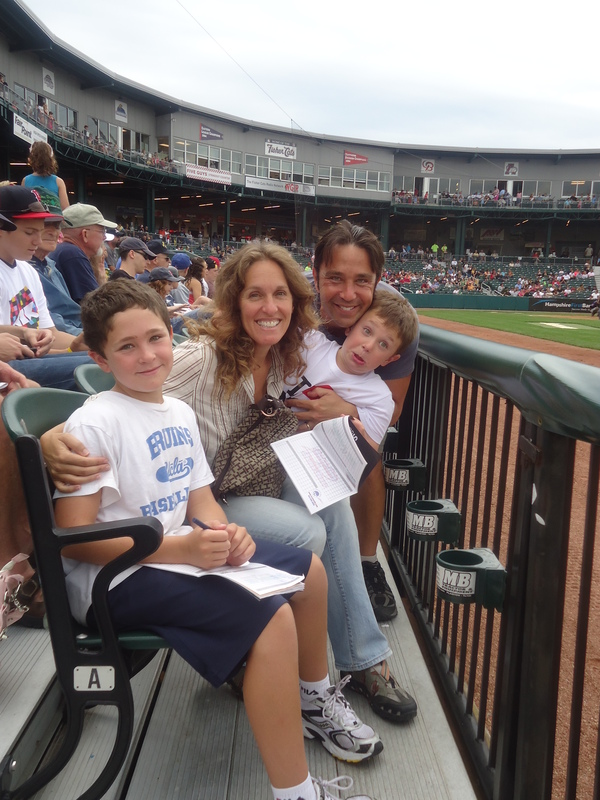 The first was to attend a Minor League baseball game (New Hampshire Fisher Cats vs. the Akron Aeros in Northeast Delta Dental Stadium). We merely told the kids we knew a great place for lunch. We mentioned that Presidential candidates often ate lunch there. That piqued their interest. “Like Barack Obama?” Aaron wondered. “Could be,” we may have responded. We walked toward the restaurant and, still not quite believing things work this way, there he was sitting at a table with 10 people, in a casual green shirt, talking about the economy. 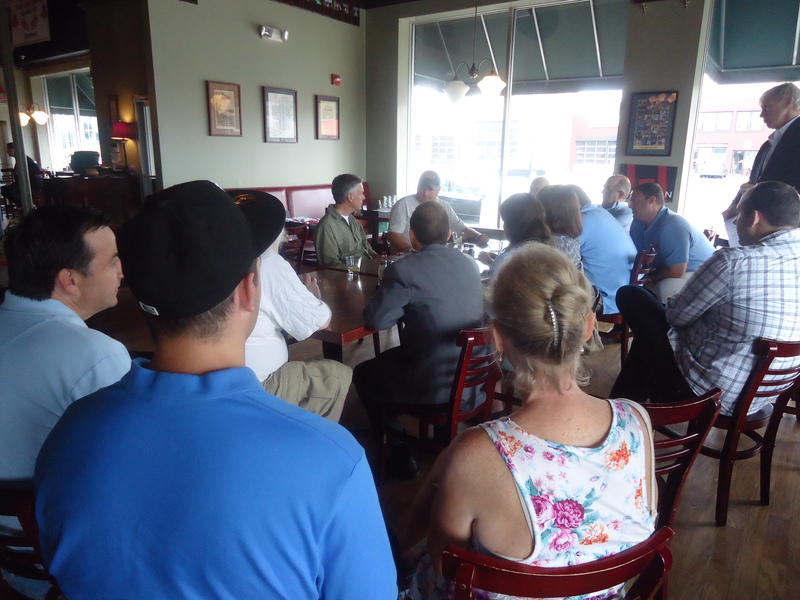 The nice Young Republicans set out four more chairs for us. We listened until the kids were bored and threatening to become disruptive, and I took them outside. Will we have shaken the hand of the next President? If our unscientific polling has anything to say, probably not: our closest Republican family told us he’s not their number one (but to send their love anyway). 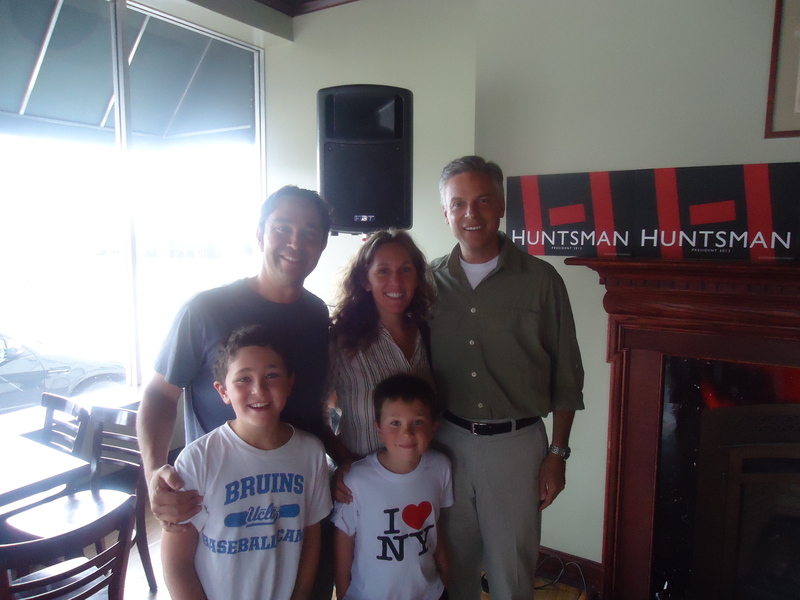 Sounds like Huntsman is too sane to win the Republican primary. I’m just saying…and I love that you are having such great new experiences. We are having great experiences. Yesterday, all four of us launched ourselves from the rope swing into Lake Todd (yes, that includes ME) from the island in the middle of the lake. 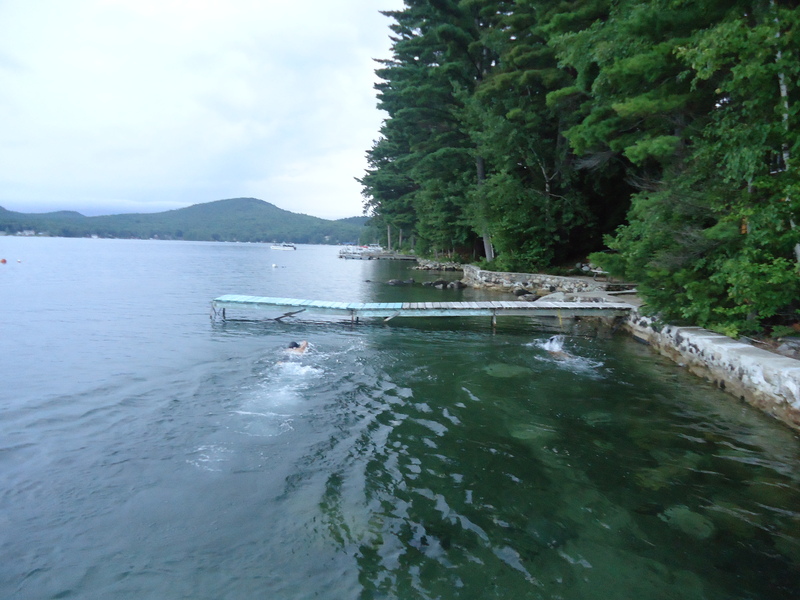 And I even swam out to the island while Christopher rowed the boys in the boat. Unfortunately for Christopher, who had wanted to swim back to the house when we were finished, I was shivering too hard to work the oars myself, so he rowed the four of us safely back home.